I am constantly reminded that my children are growing up quickly. As my daughter moves toward her teen years, I have been doing some reading about teenagers today. Who would have thought that things would be so different from my teenage years? I didn’t have a cell phone until I got married. I just heard on the news that the average teenager sends 100 text messages a day – 3000 a month. Yeah, things have changed!! Yet one thing remains the same – God’s description of a virtuous woman. My husband and I have the charge of raising one of those! We have a definition of God’s idea of a successful woman in Proverbs 31. We can teach these things to our daughters, and better yet, strive to bring God the glory by BEING a virtuous woman. The poem in Proverbs is most likely a freestanding poem that was passed down in order to help men in identifying an ideal wife. It was also a formula for a young woman to follow to become a virtuous woman. 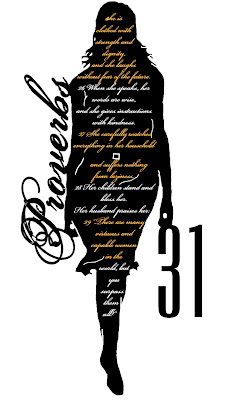 The Proverbs 31 woman is hard working and resourceful. She takes care of her children, and her husband has full confidence in her. She takes care of her house and works in the community. She also helps the needy. She’s very busy! We can all strive to bring glory to God by working hard and caring for others. Now let’s focus on her physical attributes. Oh, that’s right, her physical beauty is never mentioned in these verses. Her attractiveness comes entirely from her character. Statistics says that only 2% of women would describe themselves as beautiful, though 77% agree that beauty can be achieved through attitude, spirit, and other attributes that aren’t physical. So why is there a difference between these two numbers? The difference is that we are listening to the world’s definition of beauty rather than God’s definition. Do you believe that your beauty lies within? You are beautiful in His eyes. When He looks on you, he sees you through the blood of Jesus. He sees you as righteous because He is righteous. Are you believing the world when it comes to your beauty, or are you believing God?